CPQ can help simplify the blending of remanufacturing into your overall production process. If you have had an occasion to purchase any electronic items recently, you may have noticed more and more options for selecting remanufactured products. Remanufacturing has been around forever, but it is enjoying a rather robust growth as an industry unto itself as well as a functional part of the complex manufacturing process. Historically, the remanufacturing process was rather simple. For example, pre-owned automobiles were traded in at dealerships, the dealer gave the vehicle a mechanical once-over and fixed any obvious issues. Next, they touched up any dings, applied a coat of wax and then put it on the lot for sale. Product reclamation was easy—the customer brought the old unit right to the dealership. This model is not that far removed from what transpires in more complex applications such as re-using the space shuttle. Or, more currently, how SpaceX is reusing boosters for satellite launches with some regularity. The recycling industry has built an entire infrastructure to aid in the reverse logistics required to get a spent product back to manufacturing for reuse. This product reclamation process is one of the key challenges facing the remanufacturing process as a whole and also for individual remanufacturing applications. In the entrance way at Best Buy, you will find bins available for recycling or collecting a wide variety of reclaimed parts such as electronic components, batteries and whole products. These reclamation centers are found with increasing frequency at grocery stores, municipal government offices and other businesses. More and more manufacturers are finding great benefits from operationalizing remanufacturing activities into their overall manufacturing processes. But, there are many remanufacturing obstacles to address before the vision of a circular economy is fully realized. The Centre for Remanufacturing and Reuse, a UK-based industry group, identifies several key challenges or obstacles to expanding remanufacturing as an industry unto itself as well as within the context of a manufacturing process. Let’s take a quick look at each of these and examine how these challenges might be addressed. Core Returns – The market value of any commodity is variable. One key to removing expense from locating returnable items is figuring out where the items are, how long they have been in service and when their replacement might be imminent. CPQ and other customer-facing technology such as CRM have that data. They not only have it at the whole product level, they also have it at the component, option, assembly and part levels. 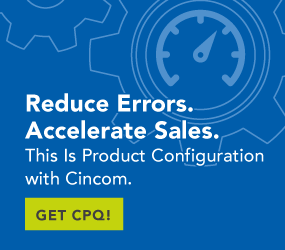 Products sold using CPQ as a configuration tool have a full BOM-created based on the assorted options selected and configuration delivered to the customer. CRM knows the delivery and installation date for those products. This data provides the manufacturer with the information necessary to anticipate reclamation opportunities in the form of upgrade or replacement sales opportunities based on service life, MTB failure rates and other metrics. Price – When parts are recycled into the production supply, CPQ can identify which parts are new and which are recycled. Pricing variability is reflected in the roll-up price calculated by CPQ. Indeed, the option between new and recycled can be deliberately built into the selection process. CPQ maintains multiple pricelists for finished goods as well as for individual components, so maintaining a remanufactured product price list is easily accomplished with CPQ. Legal Barriers – The practice of distributing remanufactured products does need to take into account any legal prohibitions that might prevent the use of reclaimed parts or materials. While these barriers will likely decrease over time as more and more companies remarket products as an option or as a standard process, there will always be some limits or applications requiring original equipment. CPQ can build these regulatory limits into the business rules that drive the part and option selection process during a product configuration. Certain customers or classes of customers may be prohibited from using these products, and some geographical- or geopolitical-based limits may exist as well. CPQ can handle these selection limits to ensure that configurations for those end-users comply with the legal and regulatory burdens applicable to them. Product Design – Certain reclaimed products may be more difficult to extract from the whole product as it is recycled. The final quality evaluation for these products may involve some variable level of suitability for re-use. CPQ can identify multiple quality levels and restrict the use of products within a given level to specific limitations. Customer Perceptions – Most of us want new products. This is especially true of higher-priced, sophisticated or complex products. There is security in the knowledge that what we are buying has not been worn or previously used in a way that will diminish the lifespan of the product we are acquiring. CPQ can clearly identify the specific content in a whole product that is remanufactured. When presented to the customer with applicable comparative cost savings realized, the customer can make an informed decision about selecting new or remanufactured. Taking the mystery out of the decision is honest and helpful. Customers may not care if certain types of parts are recycled, especially if the cost savings are considerable. Skills Shortage – This is a very real issue especially at the far end of the reverse logistical supply chain. The process of evaluating candidate parts replacement and overhauling/reconditioning of those parts may require specialized knowledge. CPQ can help with this once the recycled part is in-house by guiding the classification process using the same interactive interviewing process used to configure a product. Condition, age, quantity and other variables can be documented and prompt the ultimate classification of the products on a consistent basis. Informational Barriers – This is a very difficult issue for builders of proprietary technology utilizing processes, skills and materials that may be classified as trade secrets. In many cases, these concerns diminish over time as the competitive advantage of the proprietary aspects of the product diminish. CPQ can identify specific parts that may fit into this category. Product labeling and traceability features can help to ensure that assemblies containing this type of technology are returned directly to the manufacturer of the technology for processing. Remanufacturing is no longer a green sideshow to help companies build an image of ecological responsibility. It has become a mainstream feature of the whole manufacturing process. Utilization of remanufacturing techniques and processes will continue to grow and become more commonplace across more industries. Technology like CPQ can help manufacturers bring this option into their overall manufacturing process sooner and with less trauma.